Ten years after taking over the kitchen at Sanctuary, chef Patrick Atanalian has moved on. Over the past decade, the native of Marseille, France, has made the dinner-only restaurant a destination not only for pre- and post-Guthrie dining, but for an audience that embraced Atanalian’s artful, post-fusion cooking. His current menu features such dishes as marlin with orange mashed potatoes and blue cheese-infused hoisin sauce, pork tenderloin with blueberry-bacon marmalade and tuna tartare with mandarin gel and Tabasco-chocolate ganache, a remarkable output given the kitchen’s cramped quarters. 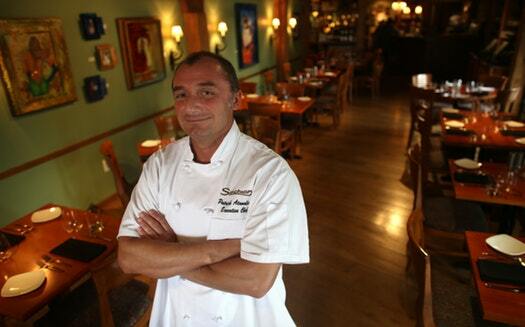 Atanalian (pictured, above, in a 2014 Star Tribune file photo) also pioneered the value-priced tasting menu. In its current form it's a five-course, $35 spread. So far, Atanalian's plans are up in the air. Oct. 14 was his last day. Atanalian’s replacement? Get this: it’s Gary Stenberg, the chef Atanalian replaced 10 years ago. Will the restaurant change? Sure. But not radically, said Kutscheid. Stenberg’s first menu will debut Nov. 4. And yes, fans of the restaurant, the $35 tasting menu — offered Monday through Thursday —will remain. Let's talk food, from restaurants and recipes to farmers markets, food issues and wine. Lee Svitak Dean, Rick Nelson and Sharyn Jackson will start the conversation. Here's the scoop on the opening plans of Twin Cities (and outstate) seasonal restaurants. The restaurant, from the team behind Lowertown's Saint Dinette, opened in June. Thursday is the last day for the bakery/cafe's locations in the Capella Tower and Baker Center. Attention to detail makes the Copper Cow, a burger-centric offshoot of Eat Street's Copper Hen Cakery & Kitchen, worth a visit. Expect to find six state-of-the-art golf simulators at the heart of Thr3 Jack, opening this summer.